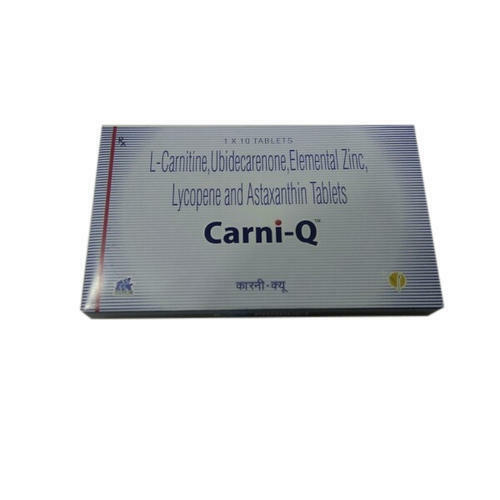 Carni-Q Tablet is used in the treatment of nutritional deficiencies. Carni-Q Tablet is a combination of five medicines: Levo-carnitine, Coenzyme Q10, Zinc, Lycopene and Astaxanthin. Levo-carnitine, Zinc and Lycopene provide essential nutrients. Coenzyme Q10 and Astaxanthin are antioxidants which protect the body from damage by chemicals (free radicals). Established in the year 2006 at Nagpur, Maharashtra, We “Amtrex Enterprise & Company” are a Sole Proprietorship based firm, engaged as the foremost Wholesale Supplier of Pharmaceutical Injection, Medicine Tablet, Pharmaceutical Tablet, etc. Our products are high in demand due to their premium quality and affordable prices. Furthermore, we ensure to timely deliver these products to our clients, through this, we have gained a huge clients base in the market.